As I was going through my dashboard yesterday and visiting the blogs that I follow, I came upon C2 Cookie Construction. 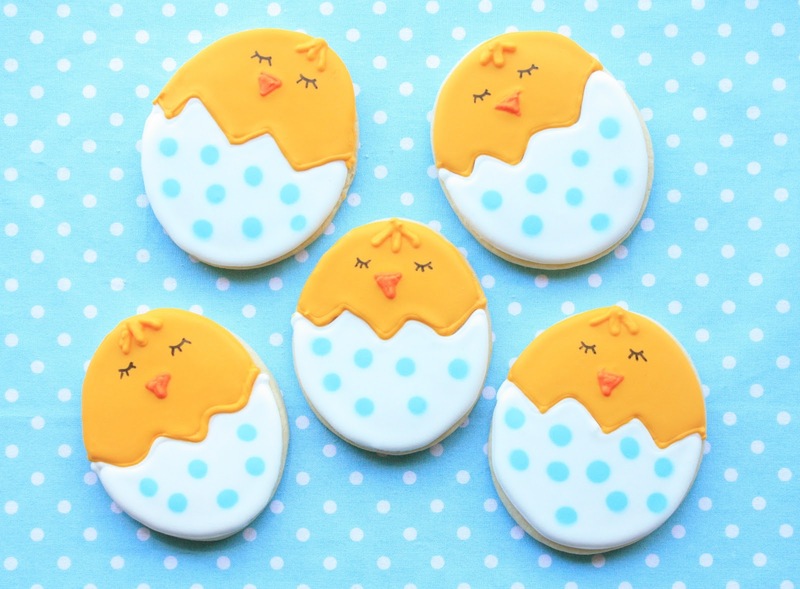 I was instantly charmed by the Easter chick cookies that Amalia had made:) So sweet! I remembered that I had a few large (3.5-inch by 4-inch), plain, egg-shaped sugar cookies in the freezer and now knew just what to do with them! Woo hoo! For once, my procrastination paid off. To make these little chickies I used a #3 tip. I first outlined the white half and let it dry for about 15-20 minutes before I filled it in with the remaining white, thinned a bit. I added the blue polka dots just a few minutes after the white was applied. I left this to dry for about an hour before I outlined the golden, top half. After about 15-20 minutes I filled the top half in with the golden royal icing. After about an hour I added the hair and beak detail. I left the cookies overnight (about 6 hours) to dry and added the eye details with a black edible marker. Thanks for the inspiration, Amalia! If you haven't visited Amalia's blog, you are really missing out! Her cookies always turn out so perfect and uniform. Happy Easter!! I love your chicks! Your wet on wet technique is wonderful!! and I love the photo with the M&M's! Wow these are absolutely beautiful!!!!!!!!!!!!! What an awesome job you did decorating these!!!!!!!!!!!!!!! Beautiful! Omgosh! So sweet. Love the closed eyes!!! Happy Easter sue!!! they are just adorable, love the eyes...so sweet! How perfect for the holiday...Happy Easter! So cute Sue. 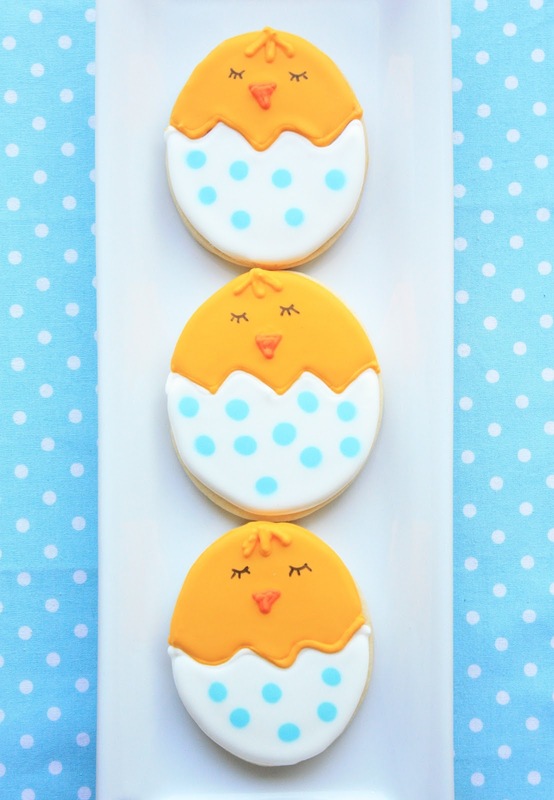 These are perfect for Easter but they would even be cute for a Baby shower. Such Cheery colors. Happy Easter! Love your little chickies cookies! They are very cute. Oh these are the sweetest! Love those pretty eye lashes. No way, these cookies are just too sweet! I love them! Sue, what fun, happy little chicks! You always come up with the best sugar cookie ideas. Just made "your" recipe the other day for sugar cookies. I had to ration them out with the family. What fun it is to give my kids decorated cookies in their lunches. Have a wonderful Easter! SoOoOo cute! Their little smiles are adorable. They look so snug and happy on their bed of m&ms :) Happy Easter! Your chicks turned out really sweet. You are really good with the wet on wet dotting technique! Saw these from Sweets for a Saturday - they're beautiful! You're very talented. Pinning so others can appreciate your work :). Completely cute with a side of whimsy! I am in love! BTW....Happy Blessed Easter to a great person! These are so adorable Sue, i love the polka dot pattern so much, especially with these colors. These are too cute! Happy Easter! Love your little chicks! Happy Easter to you! So adorable that I would love to just keep them! These are so sweet!!! I love their cute little faces. Hope you had a great Easter, Sue! Okay, now I'm feeling pretty lame about my chicks ;) These are cute as ever. So adorable! I think maybe I could even do this cookie. They are SO SWEET! I sure wish I could master soft colors! Oh my goodness! You have so many darling Easter treats! These cookies are just adorable! Chicks are my very favorite Easter treat to make! I love the sleepy chickies peeking out of their eggs. You're such a fantastic artist, Sue. I could never pull that off. 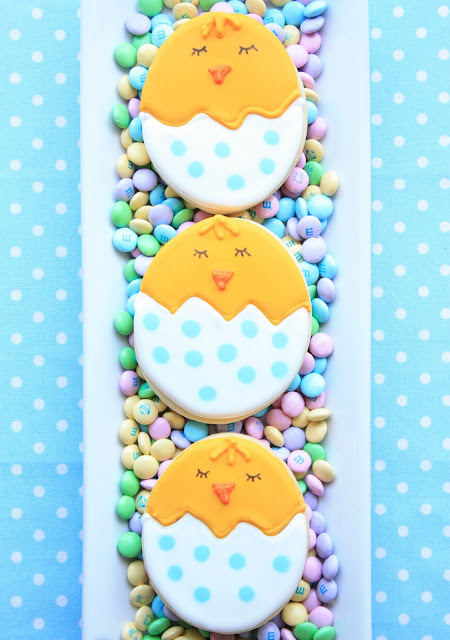 I also adore those Easter cupcakes with the lemon curd and bunny mints, and the April Fool's cookies are a hoot! Thank you so much for your kind thoughts regarding my Father - so appreciated. These are adorable. Off to pin them. What adorable cookies! Truly, I think they're too pretty to eat! Oh Sue, these are truly incredible!! Love them! Thanks for sharing at oopsey daisy!